and receive your faxes straight to your email . Faxing from your MS Office suite is simplified. Work on your spreadsheets or word processor, then print them using etherFax online fax printer. Regardless where you are at, by using a web browser you can login to etherFAX online fax web console to send, review your faxes and also manage your account settings. No minimum commitment and activation fees. Incoming faxes will be emailed to you as attachment. No more fax machine, paper or toner replacement. Send and receive faxes whenever, wherever you are. Starting from RM19.90 /month, you begin send and receive faxes instantly. Flexibility package available to suit your need. Get in touch with us to know more. Custom package for broadcasting and high volume faxing. Please contact sales for more info. How many pages am I entitled to send and receive on a monthly basis? You are entitled to receive/send 100 pages for the RM19.90 package, 250 pages for RM47.90 and 500 pages for RM89.90. Exceeding pages will be charged RM0.30 per page. What do I get when I subscribe to any of the packages? You are entitled to send and receive faxes, with pages limited to the package you subscribed, one personal fax number, and no minimum commitment. You will have access to the service and the number as long as there are no outstanding payment. Will my unused pages be carried over to the subsequent months? No. Unused pages will NOT be carry forward. How many faxing packages are there on offer and what are they? We have 4 packages offered at the moment. RM19.90 allow 100 Send/Receive combines pages, RM47.90 for 250 Send/Receive combine pages, RM89.90 for 500 Send/Receive Combine pages and Custom package for those who wants something more than 500 pages. How soon will my account be activated upon payment? Within 2-12 hours after payment has been verified. You will receive a confirmation email from us. Do you provide fax broadcasting services? Yes we do. Please email us at for more information. What are the supported browsers for etherFAX? We recommend to use the latest browser from Google Chrome, Mozilla Firefox, Internet Explorer 10+ and Apple Safari. How are my pages being calculated? Page sent or received is calculated at the end of your subscription month. Total pages sent = number of pages sent successfully to each fax number. Total pages received = number of pages received to your personal fax number. How long will my faxes be stored before they are removed? Faxes will be kept for 3 months in the system before they are automatically purged. What if I exceeded my quota for the month? 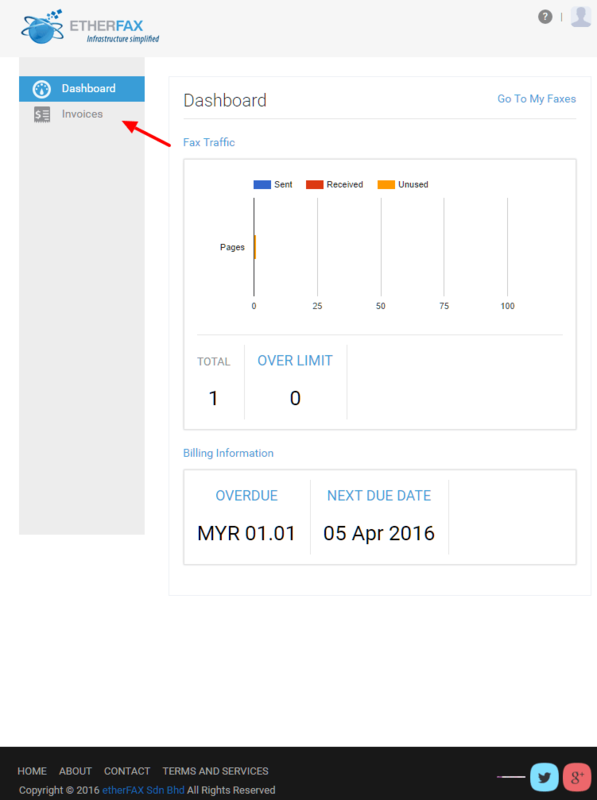 When you exceeded the quota, each sent and received page will be charge at RM0.30. Does my subscription includes international calls? International calls are blocked by default. Contact if you would like to fax to international number. We will charge RM1.50 per page for international faxes. A deposit of RM50 is required to enable international faxing. Does any 3rd-party advertising appears on my faxes? There will be no advertisement. 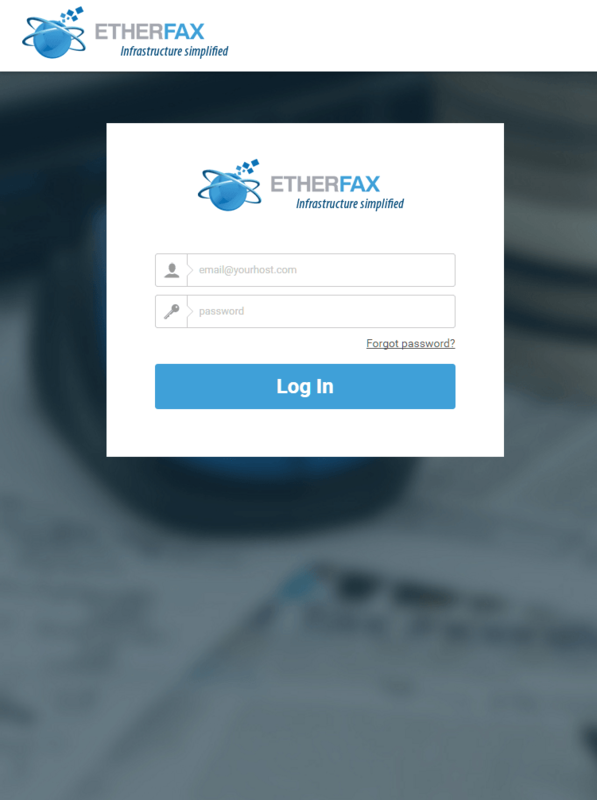 Login to etherFAX portal and click on Invoices. You can refer to step-by-step guide here. Click on 'MyFax' link at the top of the page to login to your account. You will also receive faxes to your email. Fax image will be in PDF (default) or TIF. We support credit card, debit card and interbank Giro from major banks in Malaysia. Unfortunately we have suspended Paypal transaction for the time being. All payment will be handled by MOLPay. All transactions will be in Ringgit Malaysia. For online banking and FPX payment, there will be scheduled downtime by the bank. You are not able make any payment during these hour. *scheduled above are subject to change without prior notice from respective bank. YOU ARE RESPONSIBLE FOR REGULARLY REVIEWING THE ETHERFAX WEBSITES TO OBTAIN TIMELY NOTICE OF SUCH AMENDMENTS. YOU SHALL BE DEEMED TO HAVE ACCEPTED SUCH AMENDMENTS BY CONTINUING TO USE THE SERVICES AFTER SUCH AMENDMENTS HAVE BEEN POSTED OR INFORMATION REGARDING SUCH AMENDMENTS HAS BEEN SENT TO YOU. Otherwise, this Agreement may not be amended except in writing signed by both you and EtherFax. You agree that your usage of EtherFax.my will not be used in any method, form or manner for any illegal, harrasive or abusive practices. The manner in which EtherFax.my is used is subject to all local and international regulations and laws. Full cooperation with law enforcement agencies will be provided by EtherFax.my. You are personally responsible for any and all materials that are sent using EtherFax.my at all times. EtherFax.my is not responsible for such misuse. 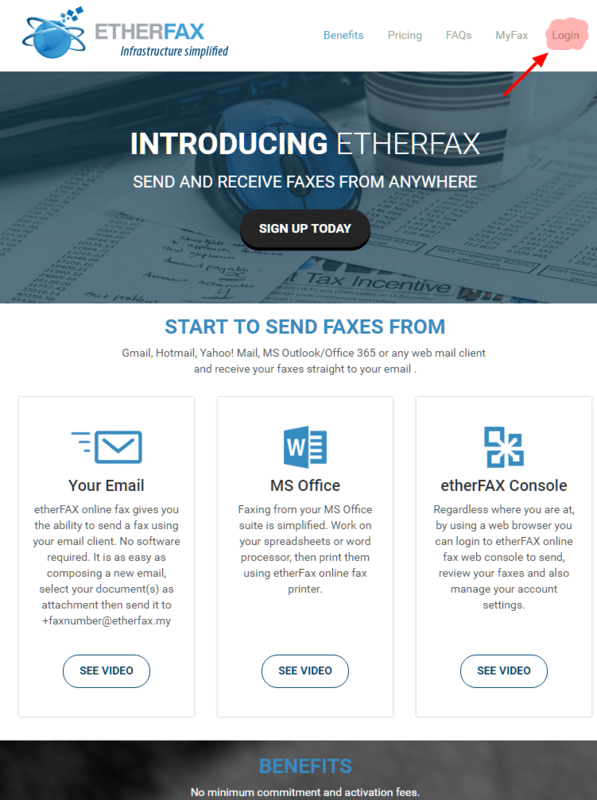 EtherFax.my will store all fax messages sent and received though your account with EtherFax.my for three (3) months as long as the account is active at no additional cost. If your account is terminated at any point, EtherFax.my will delete all the stored faxes with no recourse of retrieving them. We are not responsible for storing any faxes that you delete from your account. EtherFax.my accepts no responsibility, nor any liability for the storage, deletion, erasure, or loss of any of the faxes or documents that are stored on the EtherFax.my servers, or transmitted across the EtherFax.my services. EtherFax.my is committed in building good relationship with customers based on trust and respect for all personal information, and personal documents that are stored, transmitted or received using the EtherFax.my servers. We will not under any circumstances release to anyone any information about your account, or the contents of your account that is held on the EtherFax.my services unless required by law to turn over the information. We do not sell, transfer or pass long your contact information to other businesses, companies or people without your consent. As a customer of EtherFax.my, you fully agree that you are responsible for all faxes that are transmitted to and from you through the usage of the EtherFax.my services. EtherFax.my simply provides the appropriate hardware, software and infrastructure to allow you to send and receive faxes and are in no way responsible for the method, manner or way in which you utilize the services. Additionally, you are fully responsible for your usage and required to adhere to the terms and conditions of this site, as well as all applicable local and international regulations, laws and policies regarding your usage of the EtherFax.my website and services. As a customer you explicitly agree that you will comply and adhere to all laws relating to the transmission of information exported and imported to all countries that are contacted, as well as agree to only use the EtherFax.my services for legally appropriate activities and refrain from using the EtherFax.my services in either whole or part for the purpose of illegal activity, as well as agree to not purposefully or willfully attempt to disrupt service to the EtherFax.my servers either knowingly or accidentally, as well as agree to comply with all local and international laws, policies, and regulations for the fax services, as well as agree not to utilize the EtherFax.my services to transmit any information or materials that violate the copyright of someone nor to use the EtherFax.my services in a manner that will promote the usage of unlawful behaviour, harassing purpose, libelous claims, abusive, threatening, obscene or even vulgar content and materials. Additionally, as a customer of EtherFax.my you agree not to use the EtherFax.my services to transmit either directly or indirectly, spam, chain letters, junk faxes, or any other misusage of the EtherFax.my services. It is the responsibility of the customer to obtain any and all hardware and software needed to connect to the EtherFax.my system. This include internet access, a computer, e-mail access, smartphone or any other requirements for using the service. Additionally, the customer bears the sole responsibility for any upfront costs, as well as any ongoing costs associated with these requirements to use EtherFax.my services. You agree that failure to follow his agreement constitutes a Breach of Contract and allow EtherFax.my to cancel your services without advanced warning or notice. If in any case the customer not responding to our communication in regards to any overdue or unpaid invoice incurred by customer, we have the right to submit your information to the credit reporting agency. At any time, either yourself or EtherFax.my may terminate your account either with or without cause, upon sufficient notice. You must notify EtherFax.my by email that you want to cancel your account. There is no pro-rated refund for monthly subscribers and your cancellation is taken effect immediately. Cancelling your account will terminate any obligation that EtherFax.my has to provide you with access to any of the services including the fax number, search functions, storage functions, as well as any other services offered. If you are found to be abusing the services of EtherFax.my, we may at our sole discretion terminate your account. Additionally, your account can and will be terminated for non-payment of the fees associated with your account. Termination of your account based on a decision by EtherFax.my will terminate your access to EtherFax.my services, including the fax number, storage functions as well as other services being offered. As required to ensure the best service for all our customers, it may be necessary to change the services that are offered. This includes modifications, additions, removals and discontinuations. We will do our best to notify customers in advance, but due to restrictions, it may not be always possible to provide advanced notice. EtherFax.my is not responsible for any damages as a result of these changes. As a customer of EtherFax.my, you are responsible for the security of your personal account information. This includes your contact information, account password, and user name, as well as fax number assigned to you. In the event of a breach of security, you are to immediately notify EtherFax.my so that appropriate action can be taken to protect your account and all information. As an EtherFax.my customer, you agree to pay all charges associated with the services that you use. This includes receiving and sending faxes above your plan's allowed usage, and any additional services obtained. You additionally agree that failure to submit the appropriate charges for the services by the date due will make your account delinquent. If your account become delinquent, it can be suspended or cancelled at the option of EtherFax.my at any time. Our charge is per page basis. For example, if you send 1 page document to 10 fax numbers, the total pages sent is 10 pages. Payment of fees is done on a monthly or yearly basis, in accordance with the payment plan selected upon account creation. All fees paid for services cancelled due to customer request are NON-REFUNDABLE and will not be refunded for any reason. Additionally, any fees forfeited as a result of account termination due to breach of this customer agreement are also NON-REFUNDABLE. EtherFax.my will upon determination and with the confines of any applicable laws, terminate any account that is not kept current on fees owed. Any account that is delinquent, or suspended for non-payment of appropriate fees can be cancelled or terminated at any time, following the account falling delinquent. 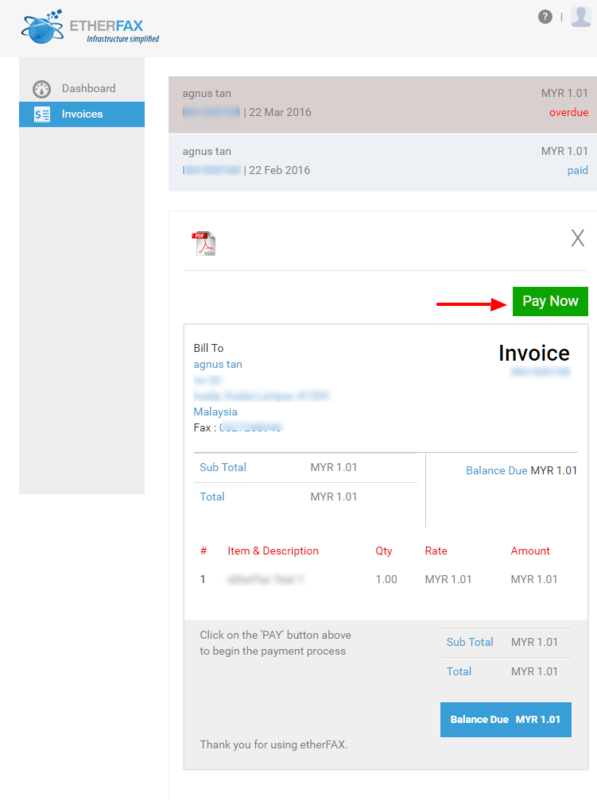 Select the invoice you would like to pay and click on "PAY NOW" button. DO NOT close the browser until the payment process complete. 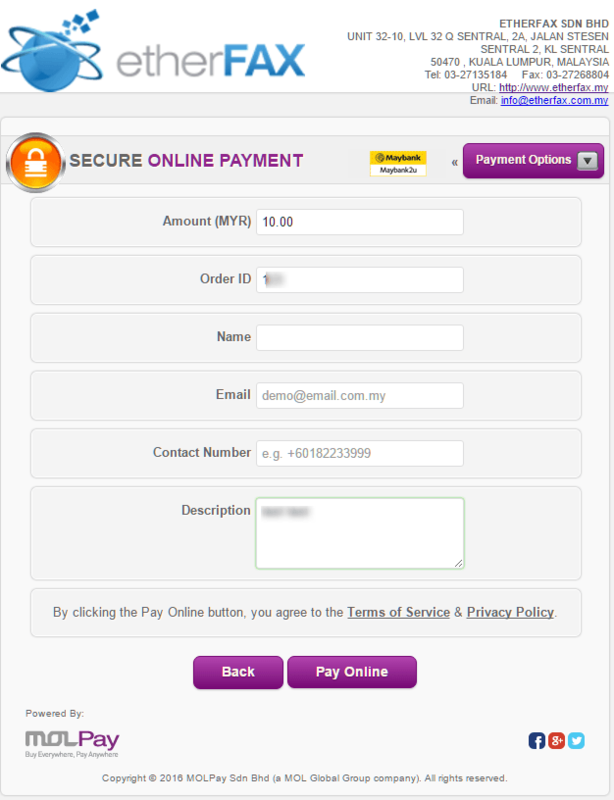 For bank transfer option, verify information on screen. Click "Proceed" button when you are ready. You will be directed to selected bank online service to complete the process. For FPX option, verify the information on screen. Click "Proceed" button when you are ready. 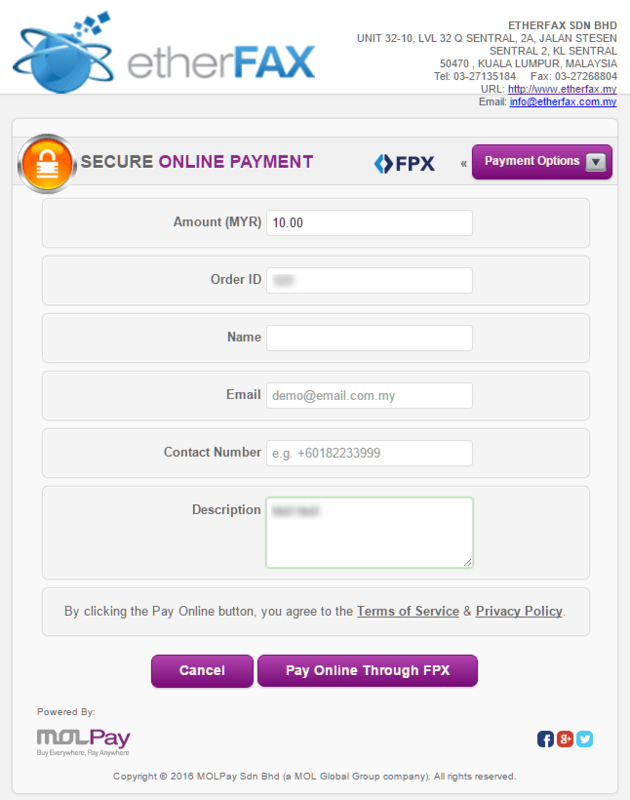 You will be directed to FPX online service to complete the process. 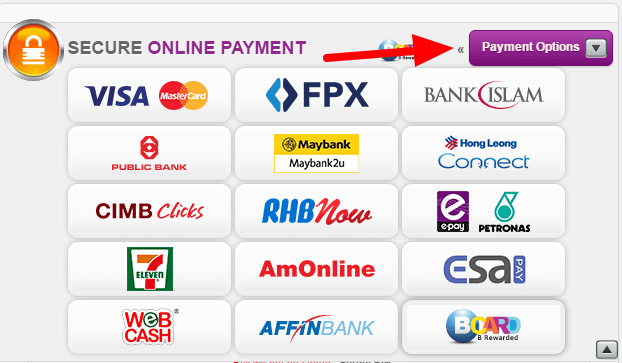 If you prefer to pay with cash, select 7-11/ePay/WebCash option. Verify information on screen and click "Proceed" button when you are ready. You will be presented the payment detail which you will need when you head to the outlet to complete the payment.